We can never plan anything in advance! I was stunned. What a thoughtful gift - just perfect for a diehard country fan, such as myself! But alas, reality set in about a month ago and we came to terms with the fact that we would not be able to attend. I'm sad to say that Bryan sold our tickets. He felt horrible doing so, and we both held our breath for as long as we could, hoping that a miracle would happen and we'd be able to attend. 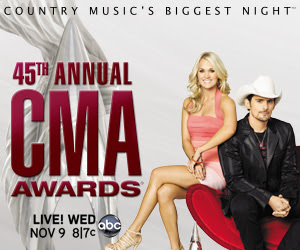 No miracle happened, so we are forced to stick with our work commitments and watch the CMA's from our hotel room. Ah that is sad. :( Have a hotel room party and enjoy watching it with your hubby. that is one awesome gift, sorry ya'll can't go! hope one day ya make it there! This was an amazing gift! I'm so sorry you guys can't go. I agree with Alison and think you two should have a hotel party and watch it! WOW! That was an amazing gift. Sorry you can't go. A hotel party does sound fun!!! Girl that is my dream to go to those too. It'll happen next year for you I'm sure! aw, so sad. i'm sorry y'all couldn't go. 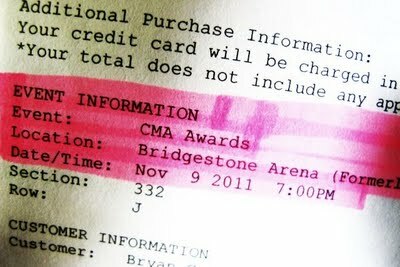 but i'm with Bryan...one day you both will be going together to the CMA's. Don't judge, but that post brought tears to my eyes. You are so appreciative even with the disappointment. I hope one day that you two will go! Oh no! That stinks...I would have LOVED to go. My friends and I had a country night before we went out on Saturday night. We were singing in dancing in my friend's apartment. Neighbors were probably ready to kill us. No one listens to country in NYC, they don't even have a country station! Oh Bummer.... But at least you are together in your hotel room.... I'm sure you will be able to go another time!! He is pretty good at gift buying I must say!! Sorry to hear you couldn't go, however, I know you will enjoy it in the future! Ok Bryan TOTALLY gets husband points for that gift! I would completely pee myself if Beau bought CMA tix for me. That's right, keep your head up! They happen every year, it has to work out at some point! I was JUST talking to JR last night and told him I thought you were going to these or the CMT's but couldn't remember which. I figured since I hadn't heard you talk about it, you weren't going :( Next time we'll all go together because it's on my bucket list too.